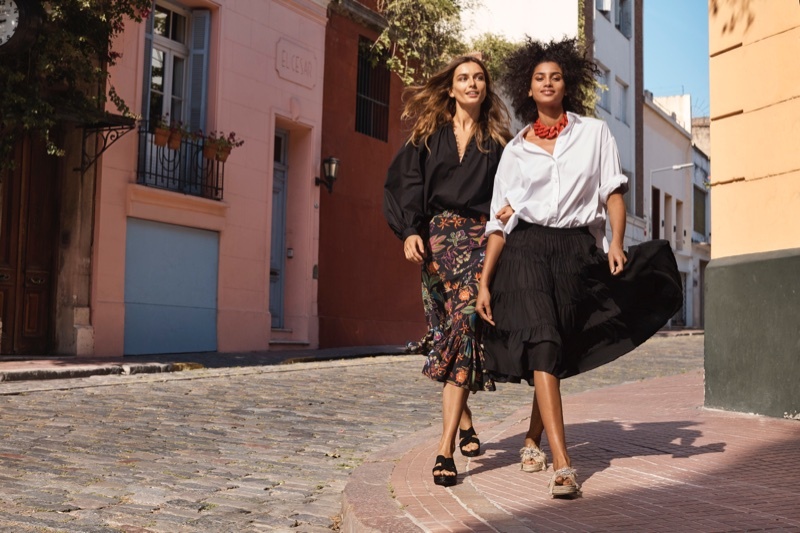 Swedish high-street fashion label H&M heads to the sun-kissed streets of Buenos Aires, Argentina, with a trio of top models. Andreea Diaconi, Imaan Hammam and Anna Ewers head out and about in the campaign, stylishly clad in the latest summer pieces from H&M. Embroidered jeans, off-shoulder dresses, skirts and printed pants are featured in the collection, and florals and solid colours along with ruffles and pleats make up the collection. The models are all smiles and sensational, and are also featured in a video advert which also includes actresses Elizabeth Olsen and Winona Ryder. A message of female empowerment is given through the print and video campaigns, and the stars are beyond chic clad in accessories and clothing from H&M.